I cruised through HomeGoods a couple of weeks ago hoping to hit on something to kickstart my living room coffee table décor. I quickly headed to the glassware wall and spotted this beautiful blue glass vase. Hello Beauty. She practically jumped into my cart. It's huge and for $16.99, it was well worth it. I sped through the rest of the store but didn’t find a thing I wanted or needed. 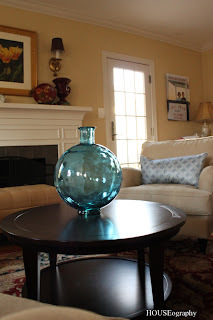 I had been hoping to find a large blue vase and there it was. I was also hoping to find a new tray but Handy Hubby may have to make what I want because I’m not sure it exists or at least not in my cheap-o price range. My tray obsession continues. For coffee tables, trays seem to work so well because they can be easily cleared to make room for snacks, drinks, puzzles, or a vicious game of Uno (Elizabeth's current obsession). Of course I already had to fish one of Alex’s many Cars vehicles out of my beautiful new vase. Fortunately I caught him as he tried to initiate the rescue mission himself!